"In the 'Interview with a Legend' series RØDE Microphones' founder and director Peter Freedman hosts an intimate discussion with icons from all areas of the audio industry including Engineers, Producers, Musicians, Artists and Entrepreneurs. A musical pioneer in the truest sense, Alan Parsons is one of the most revered engineers and producers in history. "Alan talks candidly to Peter about how hearing Sgt Peppers was a defining moment in his life and career, setting him on the path to Abbey Road Studios where he would play an integral role in such timeless recordings as The Beatles' infamous Let It Be rooftop performance and Pink Floyd's masterpiece Dark Side of the Moon. He goes on to discuss the incredibly influential Alan Parsons Project, and the future of recording." "She has the dream again that night." "Six of the Horror world's leading figures dine together. Hosted by Clive Barker with guests John Carpenter, Roger Corman, Ramsey Campbell, Lisa Tuttle and Pete Atkins." "Leave it to Kris Van Assche to remind us that, whilst Day-Glo and man skirts come and go, Paris menswear at its heart has always been about rigour and refinement. The creative director of Dior Homme opened his AW15 show by grandly sweeping back a curtain to reveal an ensemble of violinists to welcome his sleek tuxedo suiting onto the stage. Normally, the eveningwear is the final flourish to a designer’s collection but here Van Assche presented it straight off the bat as a statement of intent." "Award-winning writer, narrator and storyteller Harlan Ellison talks about his long and distinguished career in this interview conducted for Downpour by Grammy-winning audiobook producer Stefan Rudnicki. Harlan discusses audiobooks, writing the infamous 'The City on the Edge of Forever' episode of Star Trek, and touring with The Rolling Stones." Alan Hovhaness (1911-2000): Symphony No.19 'Vishnu', op.217 (1966). Sevan Philharmonic directed by Alan Hovhaness. "Brian Eno first starred as the feather-crested electronic keyboard genius of Roxy Music forty years ago. Since then he has been hailed as a pioneer, with his revolutionary experiments in ambient music and audio visual art and as featured producer on benchmark albums by David Bowie, Talking Heads, U2 and Coldplay. "Eno has given Arena unprecedented access to observe him working in his studio and talking with friends and colleagues. The master of reinvention engages with fellow influential minds, including Richard Dawkins, Malcolm Gladwell, David Whittaker and Steve Lillywhite, in a series of conversations on science, art, systems analysis, producing and cybernetics." "Orbiting the planet in his communications satellite, Commander Rick (with the aid of his trusty computer - Nancy) wonders whether there is truly a Canadian voice in science fiction and comics, or whether these artforms have become Americanized. Rick's guests include SF writers Spider Robinson, Harlan Ellison, Guy Gavriel Kay, Nancy Kress, Gregory Benford, Candas Jane Dorsey, Tanya Huff, Dave Duncan, Judith Merril, and Garfield and Judith Reeves-Stevens, with Will Eisner, Moebius, Bill Sienkiewicz, Denys Cowan and Chester Brown from the world of comic books." "Yohji Yamamoto reflects on his thirty year career in fashion. In this 20-minute film shot in Yamamoto's Tokyo studio, the designer provides a laconic, engaging and sometimes passionate commentary on his career and design values. He considers how his work has evolved since his Paris debut and explains why he designs so differently for men and women, and also provides a withering personal analysis of the current state of the fashion industry." "See the exclusive film that brings the Jimmy Choo Women's Spring Summer 2015 collection to life, starring model Ondria Hardin." The Russian Museum - The Moscow Stas Namin Theatre of Music and Drama reconstruction of the Alexei Kruchenykh, Mikhail Matiushin, Kazimir Malevich opera, Victory over the Sun (Russian: Победа над Cолнцем, Pobeda nad Solntsem), a Russian Futurist opera premiered in 1913 at the Luna Park in Saint Petersburg. Zaum and Sun: The first Futurist opera revisited. "When the Futurist opera Victory over the Sun was first performed in St Petersburg in 1913, the audience reacted violently to the chaos of Mikhail Matiushin's music, Alexei Kruchenykh's nonsensical text and Kazimir Malevich's costume. Subsequent critics and historians have reacted in a similarly negative fashion, and although the work is referred to often in histories of the Russian Futurist movement, it is largely on account of Malevich's contribution. His costumes were composed of bright geometric shapes and the backdrop included a black square - together these elements mark his first experiments with the technique of 'suprematism', which he was to continue to develop over the next two years. In 1915 at the 0.10 Exhibition, Malevich exhibited a large series of suprematist canvases composed of planes of colour, with his Black Square holding centre place, hung like an icon in the corner of the room." "This until now rarely seen 15-minute footage is of an interview that was conducted by the Dutch philosopher Fons Elders in preparation for the debate between Noam Chomsky and Michel Foucault, which was broadcasted on Dutch television on Sunday, Nov. 28, 1971. The whole interview was essentially lost for decades and was published in the winter of 2012 for the first time. It is now available as a book under the title of Freedom and Knowledge." "‘The Man We Want To Hang’ is a film shot by Kenneth Anger documenting an exhibit of Aleister Crowley’s paintings at London’s October Gallery in April 1998. The score is by Liadov." Liadov: Baba-Yaga, Op.56" by Russian National Orchestra, to be specific. "It is India in the fifth century BCE, the age of the historical Buddha, and a rather peculiar principle of reasoning appears to be in general use. This principle is called the catuskoti, meaning ‘four corners’. It insists that there are four possibilities regarding any statement: it might be true (and true only), false (and false only), both true and false, or neither true nor false." The Scottish mother of Japanese whisky. "In this short documentary filmed at Charlie Hebdo in 2006, cartoonists and editors design a satirical front page image of Muhammad." Produced by: Jérôme Lambert and Philippe Picard. "Season 2005/2006 (the world is going to celebrate the 250th anniversary of Wolfgang Amadeus Mozart's birth): with this performance of Idomeneo, Daniel Harding debuts on the Milanese rostrum, after 19 years of Riccardo Muti’s conducting. "Having reduced the size of the orchestra, Harding also cuts the score: in addition to the final ballet, and a few arias, the most impressive cut is the Intermezzo after the first act, which makes for smooth progression into the second, thus benefiting the rhythm of the dramaturgy. "Harding does nothing but delete or reduce antiquated residuals: some dances, secco recitatives and mannerist arias. … As well as at that time traditionalists were silenced by young Mozart’s genius, at present habitués and Muti loyalists has been conquered by young Harding. (On the premier, after two curtain calls, Harding joined the cast on stage for 12-minute ovation). "Personally, I’ve found this performance excellent (!) and so I’ve enriched it with english subtitles, to improve its disclosure." "This six part series on philosophy is presented by popular British philosopher Alain de Botton, featuring six thinkers who have influenced history, and their ideas about the pursuit of the happy life." "Czech archaeologists have unearthed the tomb of a previously unknown queen believed to have been the wife of Pharaoh Neferefre who ruled 4,500 years ago..."
"Just five days into 2015 and Cara Delevingne 3.0 is go. This morning, the model was announced as the latest contributing editor to Love magazine; this afternoon, her famous supercilium was put to its traditional purpose, starring in spring/summer campaign pictures for Topshop." kroonermanblack: "You left out that the writers house has a guard rail in front of it. Make of that what you will." 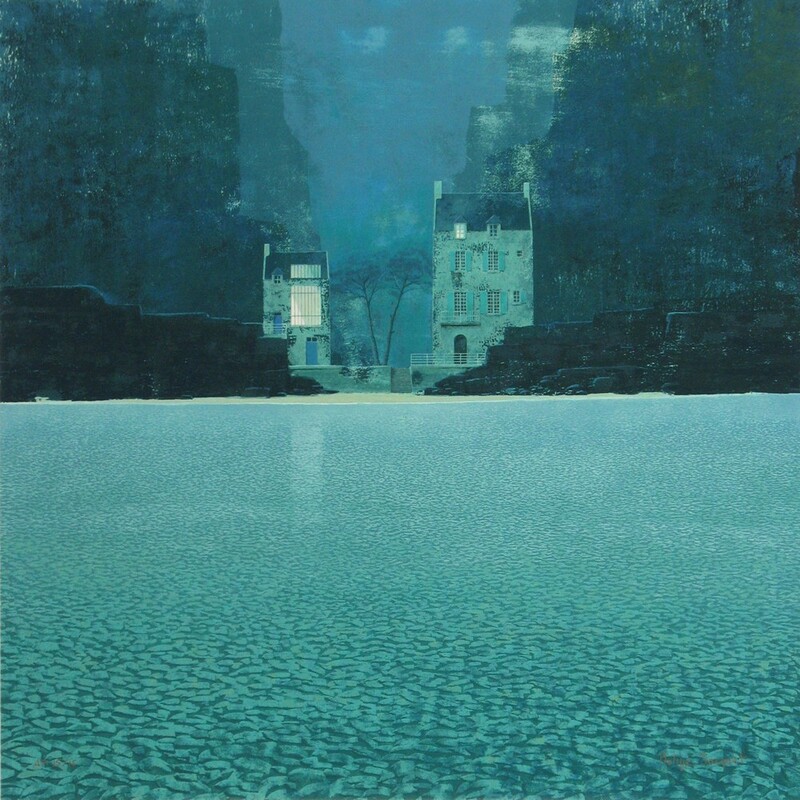 AxelleFineArts: "You can find more information about Philippe Charles Jacquet, and buy his book ENTRE DEUX MONDES from Axelle Fine Arts Galerie with locations in NYC and Boston. Read more about the artist on their website: Axelle is the only gallery in the US that represents his work! They carry original paintings by the artist, limited edition prints, small catalogs and hardcover copies of his book." "Andrew Graham-Dixon goes behind the scenes at the Rijksmuseum as the staff prepare to open the doors following a ten-year renovation, the most significant ever undertaken by a museum. Featuring over 8,000 works of art, Holland's national museum tells the story of 800 years of Dutch history and houses a world-famous collection including masterpieces by artists from Vermeer to Rembrandt. So, as the final paintings are rehung and objects settle into their new home, has the long wait been worth it?" "If Phaedra invented the Berlin-School sound, then Rubycon defined it. Taking all of the individual elements of the former album, Tangerine Dream arranged them into a winning formula: each side opens and closes with washes of ambient sound, with an improvised sequencer section in the middle. Part One opens with a rich, glorious display of the nearest the band came to Eno's style of 'ambient' music, particularly excellent in its use of electric piano to add warmth and texture. If this type of music, and TD themselves, have become synonymous with extended sequencer workouts then it's interesting to note that that particular element of the track doesn't come in until almost halfway through the piece. When it finally appears, with a meandering mellotron melody and dramatic reversed piano accompaniment, it becomes one of the most striking and memorable moments in the band's history."